A couple of years ago I stumbled across a video on the internet about Tenkara fishing and was instantly intrigued. What is tenkara? Essentially it is fly fishing with a fixed line rod designed to cast flies with a very light line. This is nothing at all new, I am sure this is the way that fly fishing started, however it seems the Japanese have perfected it and that is where the term "tenkara" comes from. 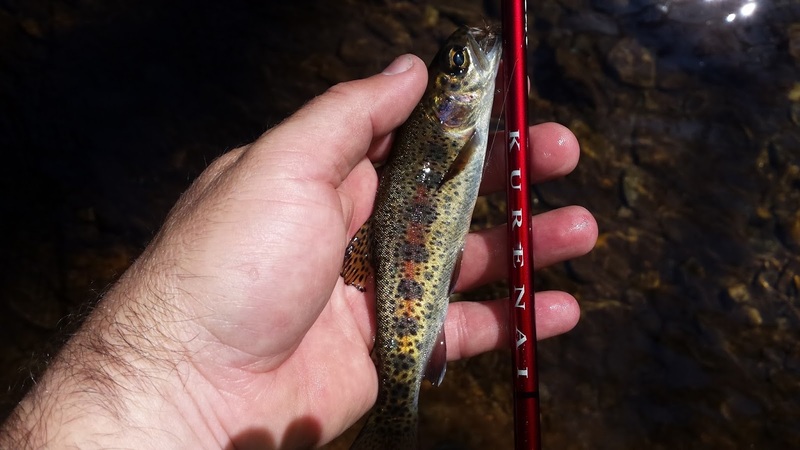 Tenkara consists of a long, usually 10 to 13', telescoping rod that is very light weight, designed to cast a level line which is just brightly colored fluorocarbon line ending with a short section of tippet and one small fly, that's it, no reel needed. 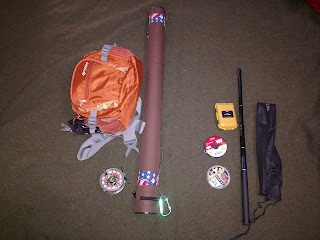 To most rural folks, especially in the south, tenkara sounds a whole lot like cane pole fishing, both use telescoping fixed line rods with no reels but that is just about where the similarity ends. 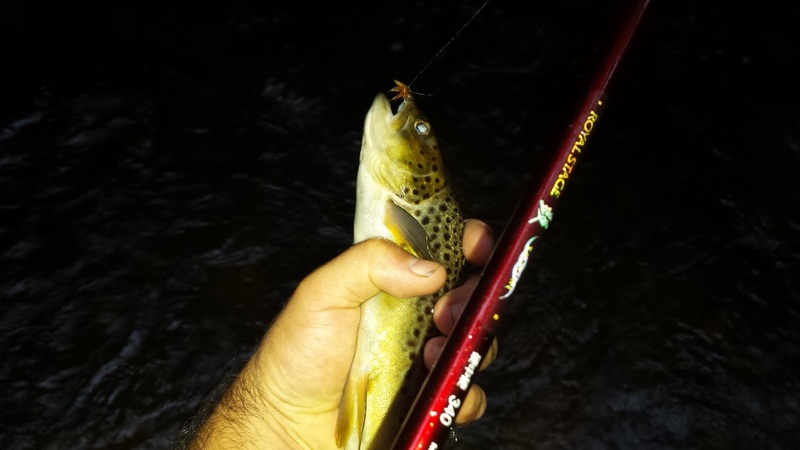 Purpose made tenkara rods are much lighter, more compact and most importantly designed to cast a small fly instead of a bobber with a wad of worms underneath it. So why would you choose to handicap yourself and fish with a rod with no reel? Believe it or not Tenkara has some definite advantages over regular western style fly fishing. I think the largest advantage is the very light line combined with the long rod. 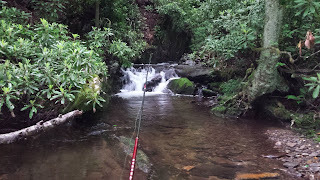 There is no thick fly line to catch the current and put unnatural drag on your fly so with tenkara you are able to get perfect drag free drifts in many parts of the stream that would be very difficult, if not impossible, with western style gear. The next advantage is the simplicity and compactness. A rod, a small spool of level line, a small spool of tippet material and a box with a few flies is all that is needed, instead of a sling pack or fly vest everything will fit in your pockets. This lightweight and compactness was a huge attraction for me. I am always looking for ways to lighten my pack and for the small backcountry trout streams I enjoy, tenkara really excels. A complete tenkara outfit can be lighter than just the reel and line from a typical western set up. On the left is my western outfit on the right is my tenkara set up. Now for the disadvantages. 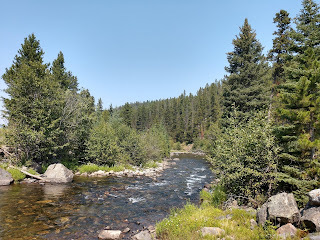 First and foremost tenkara is really not well suited for larger water, you just don't have the reach, the streams below are about perfect for tenkara in my opinion. The average tenkara rod is around 12' long with an equal length of line or maybe a little longer than the rod so at the most your talking 30'. 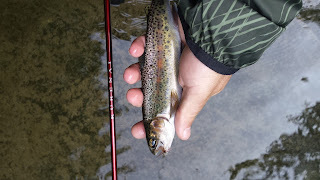 Also tenkara is mainly a small fish proposition, I know people have and do catch larger fish with tenkara but it is much more difficult than with a western set up. With tenkara there is no reel with extra line or a drag system, so if a larger fish makes a run and you can't turn it then it will break off. Not the greatest pic in the world, taking your own pics in the middle of the stream is tough, but this is about as large a fish that I target with my tenkara gear. 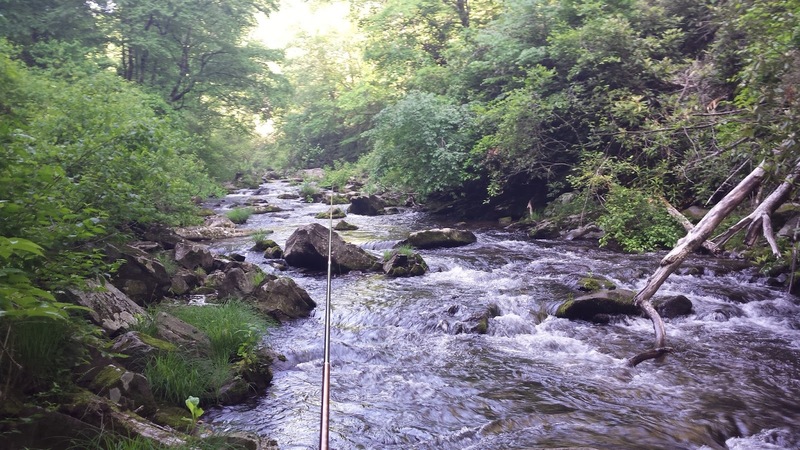 The last and maybe the biggest disadvantage to tenkara is the cost of the rods. 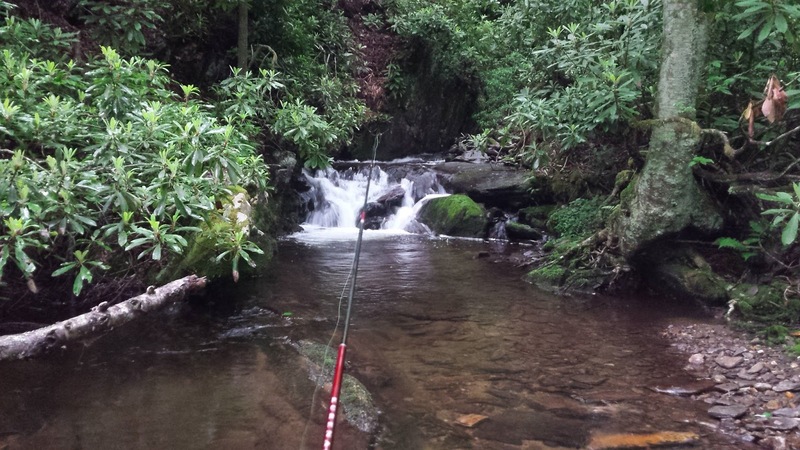 Tenkara rods start at about $100, which is pretty expensive for a glorified bream buster. Speaking of bream busters, when I first heard about tenkara I tried to go the cheap route and use a bream buster, it works...sort of. I bought B&M poles, Lews and several other makes of bream buster, probably spent enough money to just buy a tenkara rod. 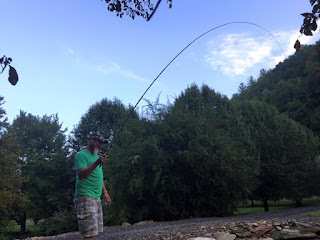 Despite the obvious size difference, the average bream buster is 3' long collapsed and is made from heavy fiberglass, I never could get one to cast a fly worth a dime. When I finally broke down and bought a purpose made tenkara rod I immediately realized why they cost what they do, unbelievably light and strong and they cast a fluorocarbon line fantastic. 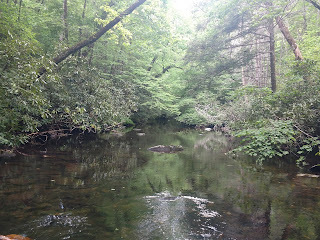 For some reason a lot of fly fishermen really look down their nose at tenkara. I have no idea why, it certainly is not the be all end all but in my opinion is just another tool in the bag. 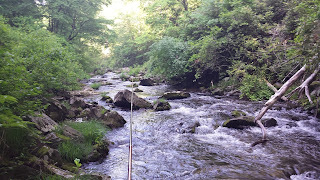 It is not going to replace my western rods but it is a lot of fun and super effective under the right conditions. If you are thinking about tenkara or just want to read more about it Chris Stewart runs a great website and store called Tenkarabum and has a lot of fantastic info about tenkara style fishing. 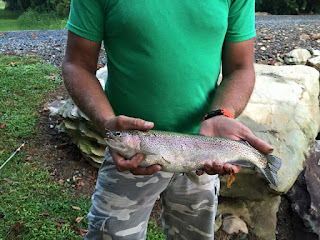 I know I said tenkara is not suited for large fish, and for the most part it's not, but I can't help but add these pics of a good friend of mine the first time he tried tenkara. That is a big ol rainbow putting a good bend in that rod.